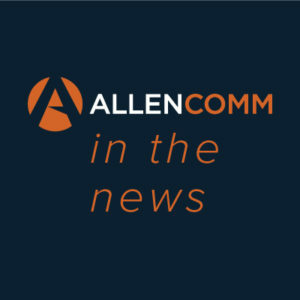 AllenComm, a leader in custom corporate training, unveils two innovative products called Siteline and DesignLab at ATD TechKnowledge in West Palm Beach, Florida, February 6 - 8. Siteline is a ground-breaking performance support platform that delivers content to learners at the point of need. DesignLab is a content management platform that empowers AllenComm clients to maintain their HTML5 content and stay relevant. Both technologies will premiere at booth #1101. On Thursday, February 7, from 10:15 am to 11:15 am “Instructor-led Training to eLearning: A Conversion, an Evolution, or a Revolution?” will be presented by Dr. Kate Worlton-Pulham, Performance Consultant. This session will cover how to optimize learning environment changes with strategies from the ILT-to-WBT playbook. Attendees will discover how current design thinking can be in the business's best interests, to not only change and adapt to new modalities but also revolutionize business behaviors. “Tackling complex learning challenges is what fuels our innovation and creativity.” - Ron Zamir, CEO of AllenComm.